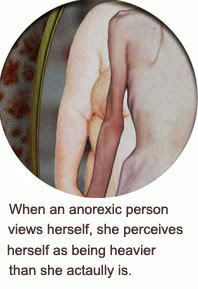 I found myself on a Pro-Ana/Mia board last night. (And no, I won't link to them....if you want to see what I'm talking about, you can search for yourself). For those who aren't sure of what that means, it's a site where people who are anorexic, bulimic, or have other eating disorders, come together and discuss their methods and give each other support on continuing. I found myself flip flopping back and forth between sheer anger and sheer sadness, both involving tears. If you're not that familiar with the disorders, don't jump to conclusions or start saying how stupid it is....for those girls (and occasionally guys), this is a constant battle. I could go on and on about what I think about the sites who 'support' continuing the battles. I could give you links to article after article after article of different places like Oprah where this stuff has brought national attention. I could help explain the inside workings of 'why' they feel the need to do such things to their bodies. I could even tell personal stories of how I've been there when people were going through it (I've never done any of this stuff myself, nor have I ever had the desire to). But honestly, none of that mattered last night. All that mattered was that I was reading about 'real' girls. They weren't statistics. They weren't text book cases. They weren't national headlines. They were real people with real problems with real feelings....and I was reading their real words. It was truly heartbreaking....and it's not going to just go away. I've seen a lot of things, and heck, I've even seen 'this' stuff before. I've been to the sites before. But last night, holy cow, people. I know many of my regular readers are my own age, but I feel the need to reach out to you guys anyway and say "hey, if you notice something, help them!" And for those parents out there, pay attention. Seriously....these girls are doing it right under your noses and you don't even see you. You may think of an anorexic girl as just an insecure twig with a body like the one above, but some of these girls start when they're much heavier....some of them will never achieve the body they want, but they're hurting themselves trying anyway. They'll never be "cured," but they *can* be helped....not without people paying attention, though. And certainly not when their only support group is a family online that is 'furthering' their disorder when no one else knows about it in person. Don't think you can help them by yourself either....it won't happen....and you could make it worse even....but if you're the first person to reach out, that's the important part.